I feel like I’m the last person to read this book. Given that it involves time travel, it’s theoretically science fiction, but really it is more properly filed under romance. I don’t read enough romances to really evaluate it as part of that genre, though, so all I can say is on that score is that while the story can be justly criticized for being melodramatic, Niffenegger is pretty successful in pulling the strings. You may be wondering how a story that has time travel in it can be anything than other science fiction. Well, definitions of genre vary. 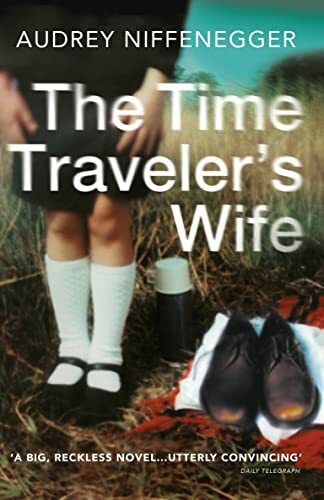 The book’s Wikipedia page quotes a critic as saying “uses time travel as a metaphor to explain how two people can feel as if they’ve known each other their entire lives”. So there’s your answer, I guess. I don’t think the book “explains” anything of the sort, but again, I come from an SF background where you start by assuming a spade is a spade. Especially space spades. That doesn’t mean that SF novels don’t have the symbolism, metaphorical interpretations, and so forth, but they are expected to take their surface elements seriously. I can’t help but approaching it as a science fiction novel, however, and in that role the book is lacking. The time travel is unexplained, but that’s more a relief than a problem. The problem is the plot is a large time travel paradox. If the past and future can’t be changed, yet you can travel into the past, how are we to resolve a case where a man meets and marries a woman precisely because he later time travels back to before they met? The novel shrugs off this concern. If you’re interested in the mechanics of time travel, this isn’t the story for you. Ted Chiang’s story “The Merchant and the Alchemist’s Gate” actually uses the very same “system” of time travel to rather profound effect. So, leaving aside the science fiction elements, what’s left? A chronologically dislocated romance between two people that’s written well enough that I enjoyed it even though I didn’t particularly like either of them. The book is so thoroughly about their relationship, to the exclusion of just about everything else, that it feels as though they don’t really have lives. Harry is a librarian, but he never seems to care too much about his job. He doesn’t need a job since he can use his time travel to generate plenty of money, but he goes to work anyway. Not because he is passionate about what he does, but because he wants to live a normal life. His wife, meanwhile, grew up in an extremely wealthy family (complete with servants…how many people had servants in 1980?) and, having completed her liberal arts education, becomes a professional paper sculptor. That’s fair enough, I guess, but little time is spent on this. They put a studio in the house for her and she has puts together a show of her work, but I didn’t get the sense she had major artistic aspirations. But these criticisms don’t really matter. The book is focused on the relationship and for most people, including me (despite coming in expecting to not like it, I’ll admit), it presents an entertaining narrative. So as long as you’re expectations are appropriate it can be widely recommended.